Maekawa’s kitchen is a family owned company, and running a mama n’ papa’s type of mobile kitchen, a.k.a. 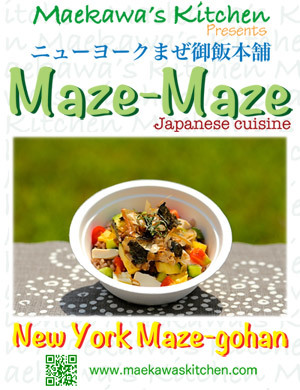 pop-up bistro, which we call “Maze-Maze”. We offer Japanese influenced cuisine with a New York twist. You may find us at local festivals, private parties, and/or corporate events. Cooking and eating are ways of our communication. As first generation Japanese parents, we try to show our US born son how to eat the Japanese way, with a hope that he’d learn to appreciate the culture and seasons presented in the food. In doing so, we’ve also got to learn cross cultural ways of preparing food we love. Soon after our son started going to school, eating had become nothing but a troublesome for him. In this particular public school in Queens, New York, the cafeteria is a place to rush. The kids are sent there class by class, taking turns, and expected to finish eating before the next class arrives. Some kids are scheduled to eat their lunch as early as 9 am, while others can’t eat until 2 pm. Then my son got in a habit of skipping lunch during school hour. He failed cafeteria. Consequently, he started failing a few more. We felt urged to do something about it. So we shifted our life to a suburb, North of New York, and transferred him to a private school. Everything has changed ever since. As going to the school in a suburb, he’s become much more relaxed. He now grows vegetables at the school garden, and is given a chance to eat his own harvest. Eating is no longer a challenge for him, and that certainly helps him to focus on his study. The school encourages healthy diet to all students, and educates their families as well. It was easy for us to implement the idea of eating healthy into our kitchen, and we soon begun communicating better again within the family. People see healthy diet as lots of do’s and don’ts. We don’t even bother. What we do is quite simple: eating as many kinds as seasonably possible, eating rice rather than pasta, and using good salt, good sugar and good oil. That’s all. And that’s how our mothers fed us growing up in Japan and exactly what we comfortably apply to our business. 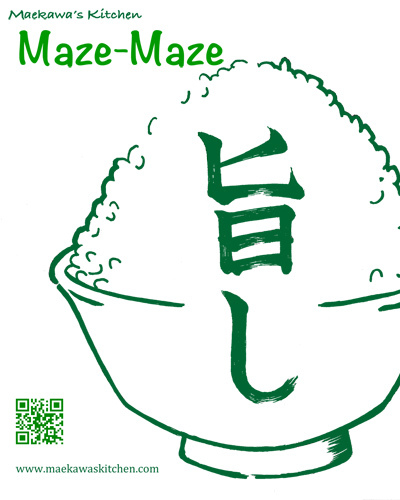 Maze-Maze was started in summer, 2015, literary from our own kitchen. We came into this business because we happened to relearn the impact that food gives people’s well-beings by dealing with our son’s case. However, we are neither health educators nor promoters. We are nothing more than catering tasty food we feel good about. Cheers to life! We have been having a blast as a culinary business team as well as a family doing the things we love.